Caring about and working for the health and happiness of others in our families, communities and the world can take a toll on our own health and inner peace. Therefore, it's a wise move to take care of our own health--spiritually, emotionally, and physically. This section will feature excerpts from two books that can help you do just that. 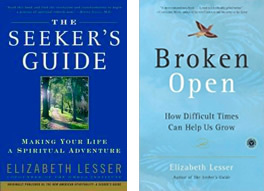 Enjoy these selections from Elizabeth Lesser's bestselling books: Broken Open: How Difficult Times Can Help Us Grow and The Seeker's Guide: Making Your Life a Spiritual Adventure (both from Random House).